경주에서 불국사로 가는 길의 북쪽 구릉자락에 위치한 통일신라시대의 무덤이다. 무덤의 형태는 정사각형이고 흙을 덮어 만든 봉분 아래에는 무덤을 보호하는 의미를 갖는 12지신상이 조각된 둘레돌이 배치되어 있다. 둘레돌을 배치하는 것은 삼국시대 이후부터 내려오는 전통인데, 통일신라시대 경주지방의 왕릉에서는 12지신상을 조각한 둘레돌을 흔히 볼 수 있다. 이 방형분은 한변의 길이가 9.5m 높이가 2m이다. 무덤 내부에는 봉분의 남쪽으로 치우쳐 직사각형의 상자형으로 축조된 굴식돌방무덤(횡혈식석실분)이 있다. 시체를 모신 널방(현실)의 동쪽 벽에는 널길(연도)이 나 있다. 유물로는 금동관장신구·은제띠고리·은제행엽 등이 출토되었다. 둘레돌의 배치· 돌널(석관)의 사용·12지신상의 조각 수법 양식으로 미루어 통일신라 말기의 최고 귀족층 무덤으로 생각된다. 신라 무덤 중 유일한 네모무덤으로, 그 계통을 알 수 없으나 고려 전기에 나타나는 둘레돌을 갖춘 네모무덤의 선구적 모습으로 평가된다. 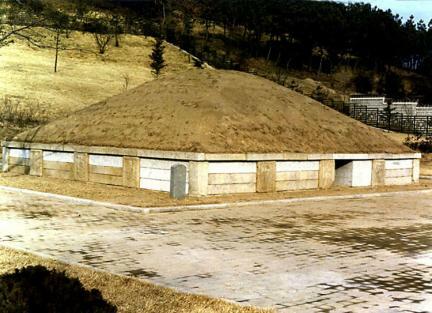 This is the square-based tomb of the Unified Silla located around Bulguksa Temple in Gyeongju. The mound is encircled with a stone base where the 12 animals of Oriental zodiac in military uniform are carved in relief, with a stone pillar at each of the four corners. Each side consists of three layers of long stones topped by wider stone bars to prevent the earthen mound from sliding down. On the south side of the base is an entrance leading to a stone chamber containing a stone stand for a coffin. 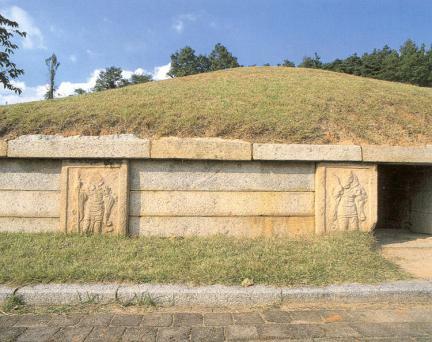 Though it has not been fully established as to who was buried in this tomb, it has been dated back to the Unified Silla Period (668-935) based on the sculptural techniques employed in the 12 Oriental zodiac images on the base, 3 on each side. The excavation work in 1920 unearthed many relics including gilt-bronze and silver ornaments. 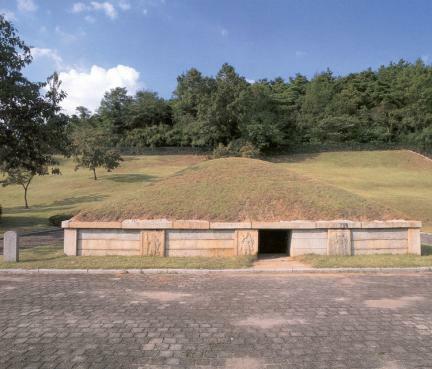 As the only square-based tomb in the Gyeongju area, it is of great importance especially to the study of Silla burial systems.